Who are the Pioneer Room Friends? 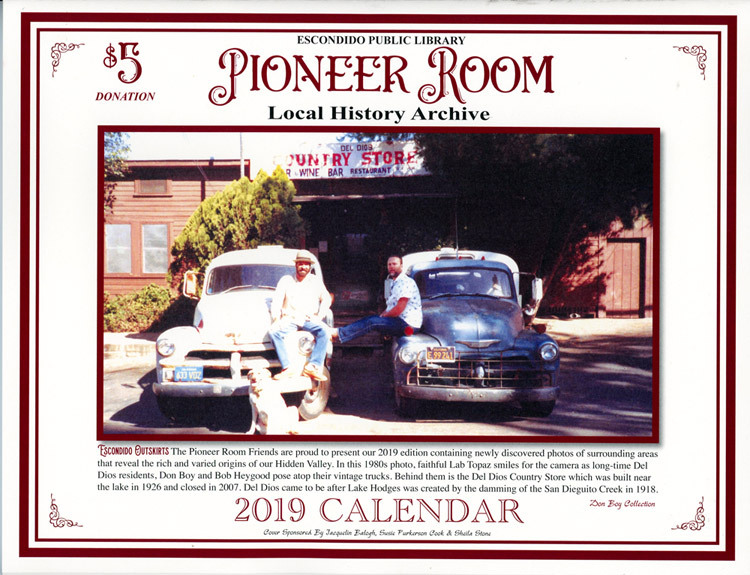 The Friends of the Pioneer Room is a non-profit organization that supports the Escondido Public Library's local history collection through organized fundraising projects such as the sale of the Pioneer Room Calendar each year. The group also sponsors local history and genealogy events. What do the Pioneer Room Friends do? Promote the use of the Pioneer Room's archival and genealogical materials. Raise funds to help purchase items for the collection and archival preservation materials. Publish and sell an annual calendar that contains historic photos of Escondido from the Pioneer Room collection. Publish a quarterly newsletter for members. Sponsor workshops and speakers to raise awareness of local history, genealogy, and the Pioneer Room's resources. Participate in community events such as the Grape Day Festival. Download and print a Pioneer Room Friend membership form.